~ Rich Hickey (creator of Clojure), title of keynote at JVM Languages Summit (2009). After more than two years of writing and loving Scala, the only regrets that I have are that I didn’t learn Lisp in college or take any programming language theory courses in grad school. Each morning that I sit down at the keyboard and start coding Scala, I get a feeling of calm, peace, and power. I know that I’m going to have another day of taking the ideas in my head and reducing them to a running computer program that will be fast and low in defects. On our way to my opinionated look at the preceding books, let’s first meander through a preamble, which I hope will also be valuable for you—feel free to initially jump ahead to the reviews themselves, and return to this preamble afterwards! Let’s take Scala which, by the way, is an awesome language in its own right. Scala, though it clearly offers to developers the functional paradigm as part of its programming model, is a hybrid functional object-oriented language, and provides a bridge from object-orientation to FP. Thus, programmers can gradually embrace the functional aspects while operating within the familiar territory of object-oriented (OO) programming. Coming back to Clojure, you have in this stunningly powerful language an almost bewildering variety of abstraction tools; naturally, this initially places extraordinary demands on a programmer venturing into this language for the first time. A bit like jumping into the deep-end of the swimming pool, getting started with Clojure can be a bit overwhelming. But rest assured that all your efforts to tame the steep learning curve, which undeniably lies along the road to mastering the abstractions offered by Clojure, will be rewarded through a deepened understanding of the programming craft itself. Even if you don’t end up doing your daily programming in this fine language, simply having access to its unparalleled strengths—and I haven’t even mentioned the mind-expanding epiphany one has on first grokking Clojure macros—can be a source of inspiration. A short take on that is coming up next. It’s difficult to convey the essence of a programming language in one sentence, but John Foderaro has come close: “Lisp is a programmable programming language”. Bear with me, if you will, and please suspend your judgment for a few moments: As you read through the following ideas and, in turn, the book reviews themselves that follow—the real meat of this post—my hope is that the rationale for my admittedly bold statement above will become clearer, especially by the time you reach the end. Back now to Clojure, which of course is a functional programming language—but unlike a pure functional programming language such as Haskell, which has zero side-effects —Clojure does permit coding with side-effects, though it clearly discourages programmers from writing code which has side-effects (aka impure code). So let’s get right on with a rundown of the finest printed resources that I’m aware of, and which have helped me grok Clojure during the dabbling that I’ve done over the past several years. Specifically, this book is about how to write Clojure code The Clojure Way. Even more specifically, this book is about how experienced, successful Clojure programmers write Clojure code, and how the language itself influences the way they create software. It’s hard to do justice to capturing the elegance and clarity with which the authors share their deep understanding of exactly what makes Clojure tick. Trust me, their peeling back the onion layers to reveal the essence of this Lisp is highly entertaining, and anything but boring! Refreshingly free of hand-waving, their narratives—interleaved with plenty of succinct, high-quality Clojure code snippets—succeed spectacularly at pulling together all the strands of Clojure’s abstractions into a well-knit fabric. The reader can reflect upon their newly garnered enlightenment, and confidently continue to deepen their grasp of The Clojure way. In some sense, all this was inevitable, I think. Lisp—the notion of writing your code directly in tree form—is an idea that’s discovered time and again. People have tried all sorts of crazy alternatives, writing code in XML or in opaque binary formats or using cumbersome code generators. But their artificial Byzantine empires always fall into disrepair or crush themselves into collapse, while Lisp, the road that wanders through time, remains simple, elegant, and pure. All we needed to get back on that road was a modern approach, and Rich Hickey has given it to us in Clojure. By the way, even if you have read the first edition, you’ll definitely want to get the second edition, which has been significantly revised to reflect, in the authors’ own words, “…we felt that a second edition should include the lessons of our professional use of this amazing language. Nothing in this book is speculative. Instead, we’ve used every technique and library, from reducibles to core.logic to data-oriented design, to solve real systems problems”. Again, I can think of no other Clojure book that has brought as much joy to me as this one has; once you’re reasonably comfortable in finding your way around Clojure code, you’ll be ready to start partaking in the joy of Clojure as embodied in the pages of The Joy of Clojure ! For starters, Clojure Programming is replete with tons of high-quality Clojure code snippets which nicely illustrate the point each that those snippets seek to convey—I was able to load the snippets into the REPL in my IDE (IntelliJ IDEA Ultimate) and step through the code without any problem. What I especially liked about the snippets was the thoughtful annotations accompanying them. I hasten to qualify with a caveat my earlier note about this being an introductory book—while it is definitely that, do note that it picks up pace rather quickly, so you’ll need to stay alert and closely read (and re-read, as need be) the narratives. Adding that this is no watered-down treatment of Clojure by any stretch of the imagination. If you’re looking for a serious, thought-provoking, first book as a companion and guide to your growing understanding of Clojure, this book is peerless. Often the best way to learn is to dig straight into the nitty-gritty of how a language is used in the real world. If that sounds appealing, the hope is that you will find that at least a couple of the practicums resonate with what you do on a day-to-day basis, so that you can readily draw parallels between how you solve certain categories of problems in your current language( s) and how they may be solved using Clojure. You’re going to bump into a lot of potentially foreign concepts and language constructs in those chapters—when you do, use that context within the domain in question as your entry point for understanding those concepts using the relevant instructional material in the first part of the book. Far be it from me to pontificate, but I’ll go ahead and throw this out there anyway: Learning Clojure programming won’t be a cake-walk. Allow me to clarify… Unlike learning the typical programming language—each with its own unique syntax and whatnot—Clojure really doesn’t have any syntax to speak of. Yes, I can hear you muttering under your breath, What is he talking about? Well, the deal is that with Clojure being a Lisp, you’ll need to get used to writing your code directly in tree form, think abstract syntax tree-coding. Writing code is often a constant struggle against distraction, and every time a language requires you to think about syntax, operator precedence, or inheritance hierarchies, it exacerbates the problem. Clojure tries to stay out of your way by keeping things as simple as possible, not requiring you to go through a compile-and-run cycle to explore an idea, not requiring type declarations, and so on. It also gives you tools to mold the language itself so that the vocabulary and grammar available to you fit as well as possible to your problem domain. Clojure is expressive. It packs a punch, allowing you to perform highly complicated tasks succinctly without sacrificing comprehensibility. There are millions of Java developers in the world, but some fewer number are working in demanding environments solving nontrivial, often domain-specific problems. If this describes you, you’re probably always on the hunt for better tools, techniques, and practices that will boost your productivity and value to your team, organization, and community. In addition, you’re probably at least somewhat frustrated with the constraints of Java compared to other languages, but you continue to find the JVM ecosystem compelling: its process maturity, massive third-party library selection, vendor support, and large skilled workforce is hard to walk away from, no matter how shiny and appealing alternative languages are. If the preceding description fits you, then Clojure Programming is the book for you. 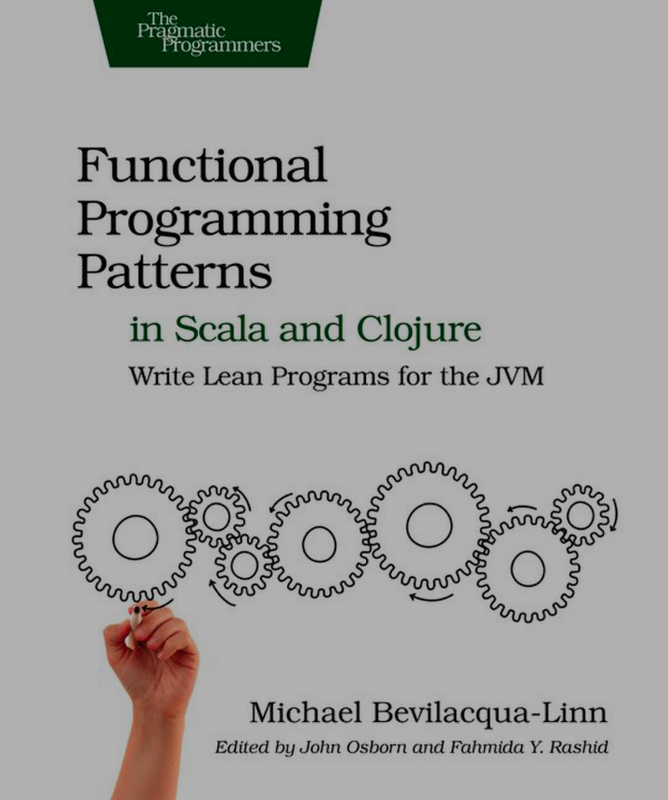 This next book will be ideal for experienced OO programmers who already understand the basics of Clojure, and who now seek to acquire the functional programming style: Functional Programming Patterns in Scala and Clojure (The Pragmatic Bookshelf) by Michael Bevilacqua-Linn. Do note that it caters equally to the unique, functional programming style each offered by Clojure and Scala. In fact, the majority of the book revolves around a lengthy series of code examples, alternating between Clojure and Scala code. Both Scala and Clojure run on a Java virtual machine (JVM), so they interoperate well with existing Java libraries and have no issues being dropped into the JVM infrastructure. This makes them ideal to run alongside existing Java codebases. Finally, while both Scala and Clojure have functional features, they’re quite different from each other. Learning to use both of them exposes us to a very broad range of functional programming paradigms. Next, an excellent introductory chapter—which covers the whole notion of how patterns and functional programming are intertwined—kicks things off. It includes a superb, annotated glossary of all the patterns discussed in the book. Following that is a chapter containing an interesting, extended example (TinyWeb), which is in part a refresher of the basics of Scala and Clojure. The author then walks the reader through the steps to gradually transform TinyWeb from Java to Scala and Clojure, with notes on how to integrate Java code with Scala and Clojure. By exploring both the similarities and the differences between Scala and Clojure, you should get a good feel for how each language approaches functional programming and how it differs from the traditional imperative style you may be used to. The second section follows, delving into the details of patterns that are native to the functional paradigm. The rationale for the heavy reliance on immutability, the wisdom in making higher-order functions (HOFs) the primary unit of composition, and creating little languages to solve specific problems—think DSLs, which, by the way, Lisp introduced to the world—are all covered in this section. Used together, these patterns let programmers solve problems faster and in a more concise, declarative style than with object-oriented programming alone. If you’re using Java and want to see how functional programming can help you work more efficiently, or if you’ve started using Scala and Clojure and can’t quite wrap your head around functional problem-solving, this is the book for you. 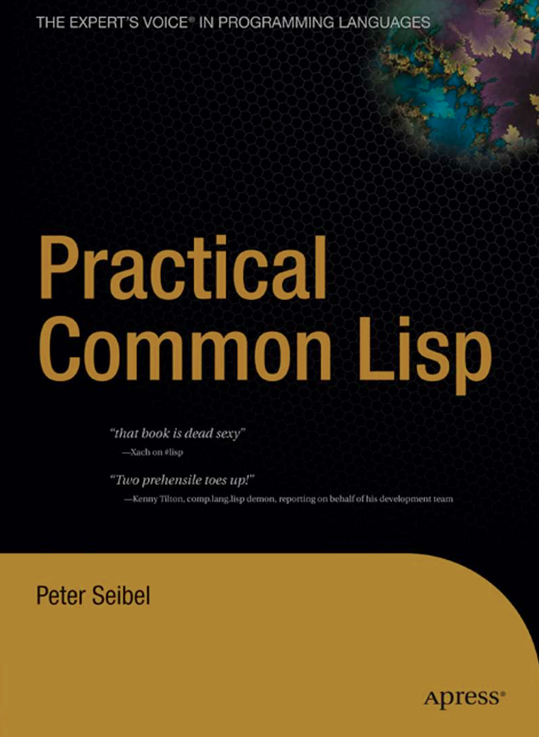 We have on our hands a powerful book in Practical Common Lisp (Apress) by Peter Seibel. Hmm… You may be wondering at this point, Isn’t this post meant to be a Clojure books’ who’s who? 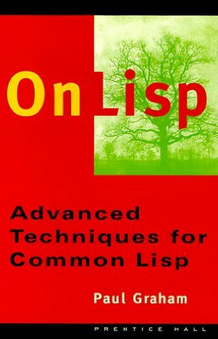 Basically, what could you possibly learn about Clojure by reading about Common Lisp? A lot, as it turns out. The point is that all Lisps share a common heritage, which is cross-cutting across them all. So pretty much everything you learn from this book will help you out with understanding Clojure better. Yes, while Clojure has introduced pleasant innovations—seamless interoperability with Java code, a rich set of literals for data and collections like vectors, maps, sets, and lists—it still retains its Lisp roots. It was really while reading and absorbing this wonderful book, Practical Common Lisp , that I really nailed down what makes Lisp macros tick. This is an amazingly well-written book that you should not miss, even if you never end up writing even a single line of Common Lisp code. 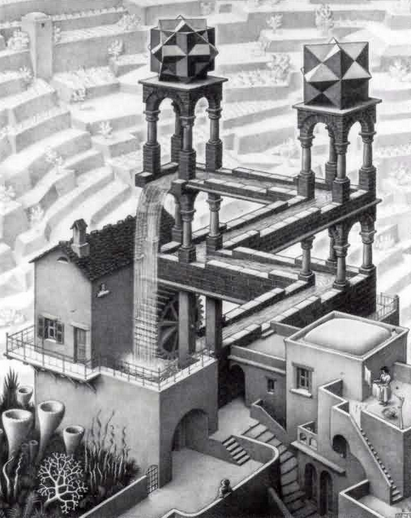 Essential complexity is the core of the problem we have to solve, and it consists of the parts of the software that are legitimately difficult problems. Most software problems contain some complexity. Accidental complexity is all the stuff that doesn’t necessarily relate directly to the solution, but that we have to deal with anyway. So I think we agree that all languages inevitably carry some baggage—it’s the relative degree of the conceptual burden that a programmer has to bear, when using the model of a given language, which sets a language apart from others. To put this in more concrete terms, allow me to share an anecdote based on my half-dozen years of programming in C++. With all due respect to those for whom the experience of programming in C++ is a pleasant and productive one—rather than the harrowing torment of Sisyphus, penitently toiling away at pushing the boulder uphill—given the bewildering variety of rules, exceptions-to-said-rules, which is the conceptual burden that a C++ programmer has to bear. The setting for my half-dozen years of programming in C++ was the beautiful state of Minnesota—beautiful, but the harsh, frigid winter season, however, seemed to stretch interminably each year—so the more I would try to warm up to C++, the more that recalcitrant mule of a stubborn language would dig in its heels, responding with nothing but mirthless frostiness, ouch. C++ is notoriously hard to learn and use. Partly, this is owing to the difficulty of mastering the language’s paradigmatic method… But mainly it is because software developers are free to express their ideas in C++ in a bewildering variety of forms. Amen. But let’s move on, shall we, onward and away from talk of purgatorial experiences? Before we do, I feel compelled to reiterate, so please take note: The preceding impressions are mine alone. I would like to think, and in fact hope, that programming in C++ for some others has been far more pleasant than mine. I wish the C++ community—from which I parted many years ago—every success, and truly wish them well. CHAPTER 1 Introduction: Why Lisp? CHAPTER 32 Conclusion: What’s Next? For those venturing into Clojure land for the first time, this book will be an excellent companion to Clojure Programming (O’Reilly)—which was reviewed earlier in this post—and you’ll find these two books complementing each other quite nicely. Good luck! One of the conclusions that we reached was that the “object” need not be a primitive notion in a programming language; one can build objects and their behavior from little more than assignable value cells and good old lambda expressions. 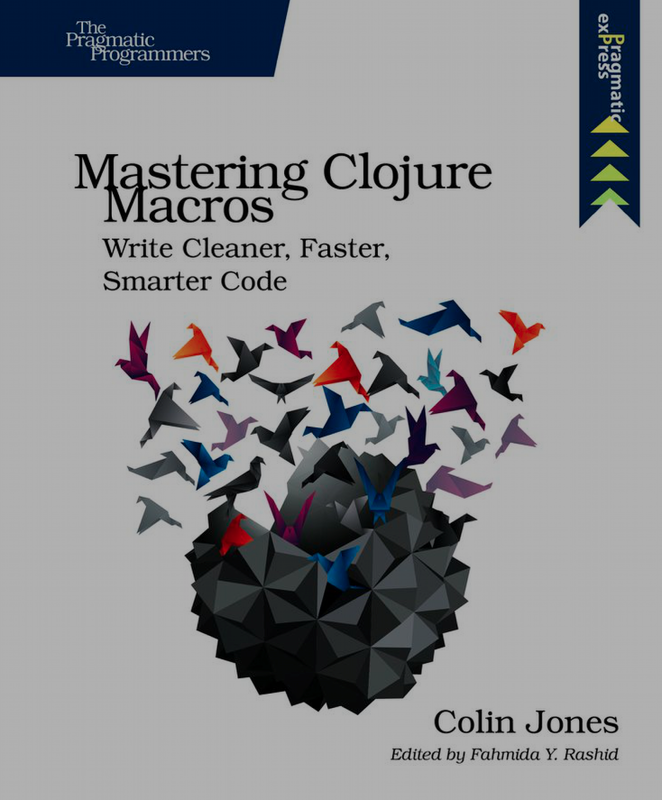 OK, getting right back now to Mastering Clojure Macros ! What I liked the most about this book is how the author thoughtfully presents considerable explanations to help the reader conceptualize exactly what happens behind the scenes to make macros possible in the first place. And as I mentioned in the preamble to this post: Yes, other languages also have macros, but all macros have not been created equal. Basically, you can do meta-programming with Clojure macros that is simply impossible in other fine languages—including Ruby, C++, and even Scala, though there is an ongoing effort towards bringing compile-time meta-programming to Scala. Much as I love programming in Scala, I matter-of-factly have to confess that Lisps—because they are the only homo-iconic languages on this planet—provide the accruing raw programming power which you, as a Clojure programmer, can wield to bend programs to your will. The use of parentheses (as a textual representation of lists) is an outgrowth of Clojure being a homo-iconic language. We’ll see what this means in (the side-notes for) Homo-iconicity, but the ramifications of it are manifold: homo-iconicity enables the development and use of meta-programming and domain-specific language constructs simply unavailable in any programming language that is not homo-iconic. Macros in Clojure are an elegant meta-programming system, a means to accomplish goals that might seem impossible in other languages. How hard would it be to add pattern matching or a new control flow structure to your language as a library (rather than patching the core language)? In Clojure, people like you and me have the power to do these things ourselves. …Can you imagine why—aside from trivia and aesthetics—we actually care that the code can be viewed as normal data? The most compelling answer is that it makes it relatively straightforward to manipulate programs. When we do meta-programming in Clojure, we can think at the expression level rather than at the textual level. It may not seem like a big deal right now, but as you’ll see over the course of this book, this simple concept is the key that allows you to write macros. 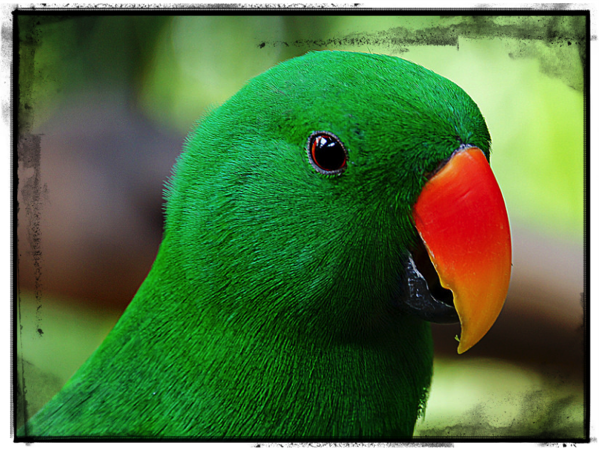 You won’t find a gentler guide to the profound subject of macros—Have fun with Clojure macros! We’re of course talking about Paul Graham. I’ve written about Paul Graham and his stellar work in some of my earliest posts that you can find on this blog-site. And it’s his book On Lisp: Advanced Techniques for Common Lisp (Prentice Hall) that I review here. This review is immediately followed by the review of another gem from him—I wish for Paul Graham to have the last word, so to say, because I can think of no other modern writer who brings as much wit and grace to the written page as he does with his works on Lisp and other diverse subjects. On Lisp is a highly literate, engaging, down-to-earth, and precise discussion of all things Lisp macros. With the exception of one other book, I’m not aware of any other books that cover this topic half as substantially; the other superb book I allude to is entitled Let Over Lambda: 50 years of Lisp , by Doug Hoyte. I would strongly suggest, though, that you first read the former, which will prepare you to tackle the latter. On Lisp is one of those books that you either understand or you don’t understand. You either adore it or you fear it. Starting with its very title, On Lisp is about creating programming abstractions which are layers on top of lisp. After we’ve created these abstractions we are free to create more programming abstractions which are successive layers on earlier abstractions. When someone asked Louis Armstrong what jazz was, he replied “If you have to ask what jazz is, you’ll never know.” But he did answer the question in a way: he showed people what jazz was. That’s one way to explain the power of Lisp—to demonstrate techniques that would be difficult or impossible in other languages. Most books on programming—even books on Lisp programming—deal with the kinds of programs you could write in any language. On Lisp deals mostly with the kinds of programs you could only write in Lisp. Extensibility, bottom-up programming, interactive development, source code transformation, embedded languages—this is where Lisp shows to advantage. I hoped to do more than simply demonstrate the power of Lisp, though. I also wanted to explain why Lisp is different. This turns out to be a subtle question—too subtle to be answered with phrases like “symbolic computation.” What I have learned so far, I have tried to explain as clearly as I can. I don’t know about your reaction, but when I giddily read this passages, I sure fell for it, hook, line, and sinker—I’m a sucker for ravishing prose like that and, of course, for beautiful code. This is a terribly exciting book… It breaks down… Lisp programming into its basic atoms, and builds it back up again into edifices of terrifying cleverness that will leave you wondering. It’s rare that a programming book can take you by surprise, but this one will. Again, I paraphrased above the words of Jeremy Ashkenas to reflect my own, near-identical, sentiments toward On Lisp. What’s quite amazing, too, about On Lisp is the exposure to a plethora of Lisp technique you’ll get by poring over its pages. In fact, as the author himself notes, “Just as a tour of New York could be a tour of most of the world’s cultures, a study of Lisp as the programmable programming language draws in most of Lisp technique”. Speaking of Lisp technique, when you’re ready for exposure to additional mind-expanding technique, albeit with far less focus on Lisp macros—for which On Lisp and Let Over Lambda remain the champs—you simply can’t go wrong with perusing the gem from Peter Norvig entitled Artificial Intelligence Programming: Case Studies in Common Lisp , affectionately known to its adherents by the acronym PAIP. Lisp’s flexibility allows it to adapt as programming styles change, but more importantly, Lisp can adapt to your particular programming problem. In other languages you fit your problem to the language; with Lisp you extend the language to fit your problem. Because of its flexibility, Lisp has been successful as a high-level language for rapid prototyping in areas such as AI, graphics, and user interfaces. Lisp has also been the dominant language for exploratory programming, where the problems are so complex that no clear solution is available at the start of the project. Much of AI falls under this heading. Richard Gabriel once half-jokingly described C as a language for writing Unix. We could likewise describe Lisp as a language for writing Lisp. But this is a different kind of statement… It opens up a new way of programming: as well as writing your program in the language, you can improve the language to suit your program. If you want to understand the essence of Lisp programming, this idea is a good place to start. Enough said. There are a ton of substantial, extremely high-quality programming examples in ANSI Common Lisp , which bear the trademark virtuosity of its expert author-programmer-entrepreneur. 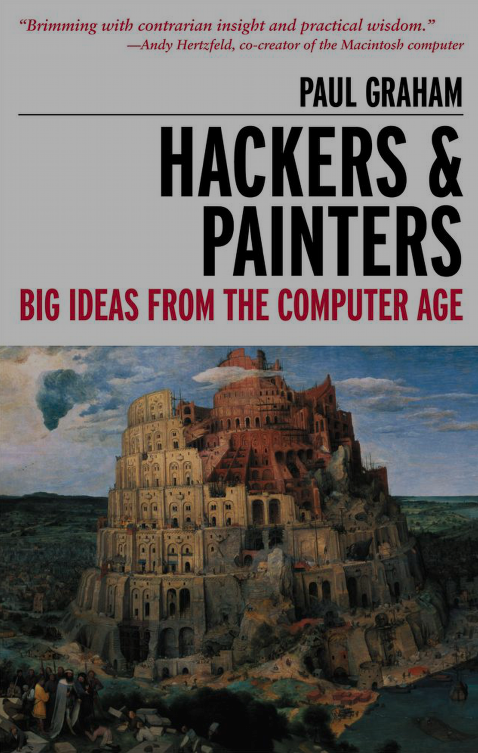 Last, but certainly not the least, is this beguiling and highly entertaining book, Hackers & Painters: Big Ideas from the Computer Age (O’Reilly), by Paul Graham. In fact, if you recall my remark at the very outset of this post—where I had noted that “I wish for Paul Graham to have the last word, so to say”—I can think of no other modern writer who brings as much wit and grace to the written page as he does. Hackers? Aren’t those the people who break into computers? Among outsiders, that’s what the word means. But within the computer world, expert programmers refer to themselves as hackers. And since the purpose of this book is to explain how things really are in our world, I decided it was worth the risk to use the words we use. With that definition to level-set our understanding of exactly who hackers are, I draw your attention to the fact that there’s so much brilliantly endearing and accurate observations—including those on the role and impact of computing on the larger world, but more on that later—jam-packed into this book that you’ll want to pore over every nook and cranny. And I literally mean, like, right down to the Notes section—which everyone, including myself, skips when reading a typical book—because Hackers & Painters is not your typical book. You don’t want to miss the nuggets of wisdom tucked away in the recesses of this fantastic book. And I didn’t even mention the top-notch Glossary, which appears before the Index. Different kinds of work have different time quanta. Someone proofreading a manuscript could probably be interrupted every fifteen minutes with little loss of productivity. But the time quantum for hacking is very long: it might take an hour just to load a problem into your head. So the cost of having someone from personnel call you about a form you forgot to fill out can be huge. This is why hackers give you such a baleful stare as they turn from their screen to answer your question. Inside their heads a giant house of cards is tottering. What makes Hackers & Painters truly special is the exceptionally cultivated writing skill that the author wields in sharing insights, which of course are based on his equally exceptional programming skills. To get a sense for this virtuosity on display, in both spheres—the one where man communicates with fellow readers, the other where man communes with the computer—there’s no substitute for reading the book itself. My impressions notwithstanding, and which I’ve tried to convey here, you really have to read this book and form your own assessment. ...a computer language is not just a way of getting a computer to perform operations but rather that it is a novel formal medium for expressing ideas about methodology. Thus, programs must be written for people to read, and only incidentally for machines to execute. So I’ve read Hackers & Painters at least six times since I bought it, way back when I lived in wintry Minnesota. And unlike my experience with the assembly-language-on-steroids that is the C++ language, I positively warmed up to the Lisp philosophy enshrined in its pages. Each time I re-read this delicious book, I seemed to find anew yet another insight, and this circling back continues as a virtuous cycle to this day, illuminating and informing me, deepening my appreciation for the role of computing—especially his stellar coverage of (Common) Lisp—in the digital world whose infrastructure is unerringly gravitating toward embracing the complexity-taming foundational work with which John McCarthy enlightened the functional world in 1958. What I mean is that Lisp was first discovered by John McCarthy in 1958, and popular programming languages are only now catching up with the ideas he developed then. Now, how could that be true? Isn’t computer technology something that changes very rapidly? In1958, computers were refrigerator-sized behemoths with the processing power of a wristwatch. How could any technology that old even be relevant, let alone superior to the latest developments? I’ll tell you how. It’s because Lisp was not really designed to be a programming language, at least not in the sense we mean today… But in late1958, Steve Russell, one of McCarthy’s grad students, looked at this definition of eval and realized that if he translated it into machine language, the result would be a Lisp interpreter. Suddenly, in a matter of weeks, McCarthy found his theoretical exercise transformed into an actual programming language—and a more powerful one than he had intended. So the short explanation of why this 1950s language is not obsolete is that it was not technology but math, and math doesn’t get stale. A notation for code using trees of symbols and constants. The whole language there all the time. Paul Graham’s take on the last idea in the preceding list—in his memorable words, “The whole language there all the time”—is in particular just plain ineffable, and worth lingering on! …You write programs in the parse trees that get generated within the compiler when other languages are parsed. But these parse trees are fully accessible to your programs. You can write programs that manipulate them. In Lisp, these programs are called macros. They are programs that write programs. Oh, goodness. I wasn’t quite planning on this… So I dwell in a world powered by the duo dynamos of Java and Scala, along with their respective frameworks each. 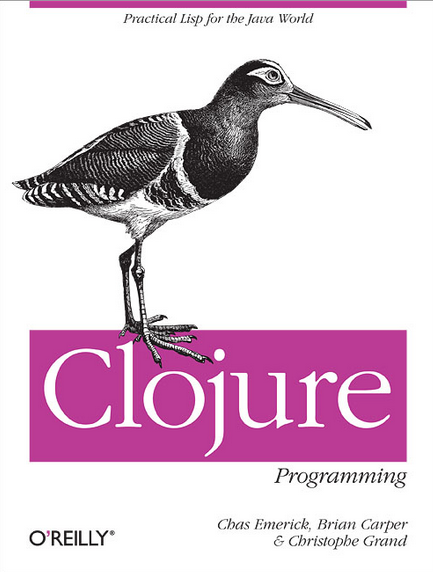 But my fondness for Clojure in particular, and the Lisp philosophy in general, never really left me, I realize. Functional programming, math, oh my! In putting together my thoughts for these reviews—in particular while reviewing the last two books, where I let Paul Graham have the last word—I’m grippingly reminded, yet again, how some things just never go out of style. Ever. We keep coming back to the basics. Functional programming is inspiring a renaissance in the way we craft software. MapReduce, Domain-Specific Languages, and Lambda Architecture, anyone? Go to any open source project hosting site, and perform a search for the term Lisp interpreter. You’ll likely get a cyclopean mountain of results from this seemingly innocuous term. The fact of the matter is that the history of computer science is littered with the abandoned husks of Lisp implementations. Well-intentioned Lisps have come and gone and been ridiculed along the way, and yet tomorrow, search results for hobby and academic Lisps will have grown almost without bounds. And yes—Clojure, Common Lisp, Scheme—long live all the Lisps of the world! 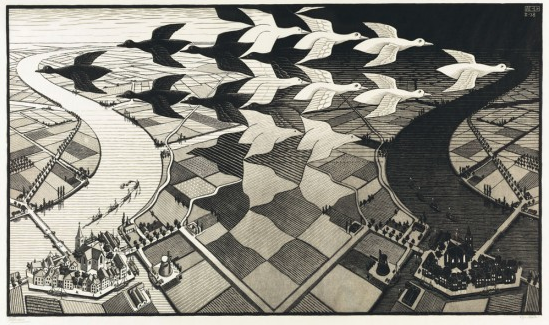 The loveliness of virtuous feedback—Escher has done it, yet again! Do you find that your experience of reading any of these books was different than mine? Perhaps some qualities that I didn’t cover are the ones that you found the most helpful as you learned Clojure and its ecosystem. 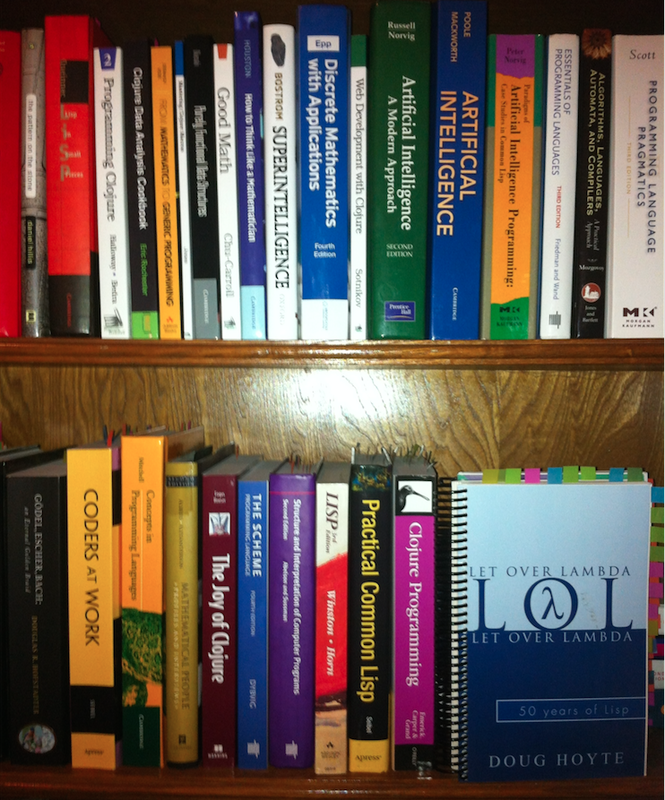 Did I leave out any of your favorite Clojure book(s)? If so, what could I also review, perhaps in a future blog post. My hope is that these brief vignettes will help you in your journey to grokking Clojure—meandering out of necessity through its close cousin, Common Lisp—otherwise, you will miss out on some evergreen classics that inform how Clojure has been put together. Adding an afterthought here, more akin to a post-script 🙂 My hope, again, is that these brief vignettes will help you in your journey to grokking Clojure. But I enjoy writing—more on that in a moment—so that I would write even if I had an audience of only one :)But as I had commented in a recent post, Best Scala Books, I was pleasantly taken by surprise—I had glanced at the statistics of visitors to this post to learn that over 3,800 readers like you (and counting) have now made the time to come read what I had written. So thank you for your gracious time and interest!As promised in my comment on that post, this post on Clojure is my way of saying, thank you!Ah, lest I forget, to address my point above about how I derive joy from the craft of writing this blog on technical subjects that intrigue me—So a large part of my enjoyment is informed by the following mindset. Hearkening back to what someone has thoughtfully said, I write code to better understand what I design. Along with my resonating with the preceding metaphor during my daily work of design and coding, and closer to the current theme, I write prose to better formulate what I think.Again, thank you. And I encourage you to share your thoughts and reactions to what you read on this blog, through your comments! Thank you for this post, I can see you put a lot of work into it. 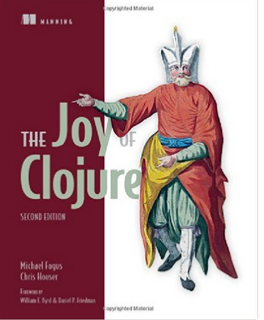 I've ordered the Paul Graham book and am looking at getting The Joy of Clojure.Do you know if the “Clojure Programming” book is still up to date, as I see it was published back in 2012? Has the language stayed relatively stable since then?My only experience is with Emacs Lisp, but would like to learn Clojure as well. Bryan (Innes) recently contacted me and graciously shared a superb resource on all things Lisp, which, in turn, I wish to share with you all:Common Lisp: Intro, Resources & FAQOne of my all-time programming heroes (Guy Steele) is widely regarded as the father of Common Lisp, and it gives me great pleasure to share the preceding resource. Thank you, Bryan! Amazing Blog And I Have Read Your Blog It Is Very Interesting And Useful Post And Your Writting Style Is Very Good.Best Books on hacking. Thanking each and every one of the nearly ten thousand folks (9,152, to be precise, when I checked the stats a minute ago) who dropped in to read this Clojure post! Thank you, Aliya, for your gracious comment. Glad you enjoyed reading my essay. We have got composing php coding for your task work. Our administrations 24/hour online for your critical work you merely have to be compelled to a faucet on this web site. Thanks for your marvelous posting! I genuinely enjoyed reading it, you might be a great author.I will make certain to bookmark your blog and will come back later in life.I want to encourage you to ultimately continue your great writing, have a nice afternoon! Thanks for another wonderful article. Where else may anyone get that type of info in such a perfect approach of writing?I have a presentation subsequent week, and I'm on the look for such information. You can definitely see your skills in the work you write.The arena hopes for more passionate writers such as you who are not afraid to mention how they believe.Always follow your heart.